Description of "Innovate E-Magazine issue 2 (eBook)"
INNOVATE is a new literary and artistic e-magazine, devoted to bringing original and thought-provoking features from established and up-and-coming authors, artists and performers, as well as to pioneer new frontiers with enhanced media. We are proud to keep up our tradition of author interviews with Brien Foerster, archaeologist, pre-historian and writer on Peru, S America and the Pacific. Introuding the Artist Interview, we have Tamala Baldwin, talented young American singer and performer. Our Art Feature this month is Art Zeal, a fascinating new home for artists on the web. Guest Feature is Indie and Proud by Ingrid Hall, a year-long campaign to raise the profile of independent authors. We have short stories by Elizabeth Audrey Mills, KD Rose and Mark Fleming as well as a short thriller from Eric J Gates and naval alternate history by Aaron Sargon. Serialised stories continue with Grey Wolf's alternate history The Library and Swaroop Acharjee's Beyond Nemesis, will Sherlock Holmes save the Titanic! Biting political satire is provided by the sharp and witty mind of Alec Hawkes, whilst in contrast the Poets' Corner examines the theme of Hopeless Love. We introduce the monthly Art Gallery with works from artists including Derek Roberts, Louise Fletcher and Hilary Bryanston. Grey Wolf is the Editor of Innovate E-Magazine as well as being a poet and an author in Alternate History. Swaroop Acharjee is an Indian poet and author. Alec Hawkes is a British writer, a political satirist and author of travelogue pieces. Elizabeth Audrey Mills is a British poet and author, including in the genres of Historical Fiction and Teen Fantasy. KD Rose is an American author who writes across several genres, as well as being a poet and a creator of thoughtful blog pieces. Mark Fleming is a British author, graphic designer and screenwriter. 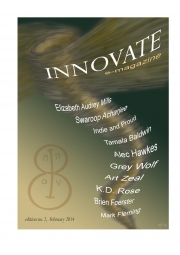 Reviews of "Innovate E-Magazine issue 2 (eBook)"